On June 11th, think-cell, the leading provider of productivity software for PowerPoint users, announced that it is launching think-cell version 9, the artificial intelligence (AI)-powered update of its signature software, which empowers users to create PowerPoint presentations with stunning charts and layouts in minutes. "Building visually stunning presentations can be a pain-staking manual process even for the most qualified graphics experts," said Markus Hannebauer, think-cell co-founder and CEO. "However, think-cell is committed to removing these burdensome roadblocks, encouraging PowerPoint users to re-imagine how they communicate data-driven insights and findings. Data is rapidly becoming the most valuable resource for businesses today, and the process of creating dynamic charts to interpret that data should never be more complex than the data itself." 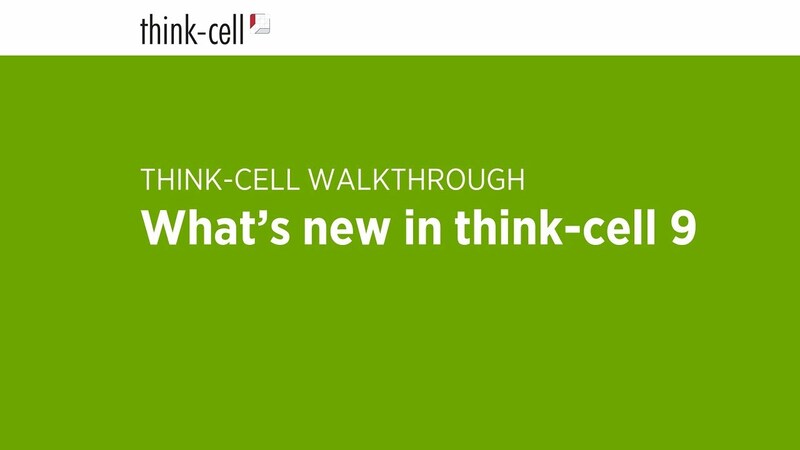 Our CEO Markus Hannebauer shows you around and presents the most important new features of think-cell 9 in this nice short video. You can find further details below. think-cell's text boxes have been given a boost of intelligence. You can now use them to create complex slide layouts without manually moving or resizing any elements (learn more). Watch the video to see how it works. Make your pie charts stand out even more by converting them to our newest chart type, the doughnut chart. And yes, doughnut charts look just like they sound. They’re essentially pie charts with a hole in the middle. This new chart design helps to accentuate the data slices and provides a place to highlight additional information. Learn more. For better visual quality and faster editing, think-cell 9 uses PowerPoint's native chart component to render charts instead of the legacy MS Graph component. This also removes several other limits, e.g., scatter and line charts can now contain more than 4,000 data points. think-cell's user interface itself is not changed at all by the new rendering back-end. You will just notice the improved visual quality and better compatibility. Create presentations automatically by merging template charts with JSON data. 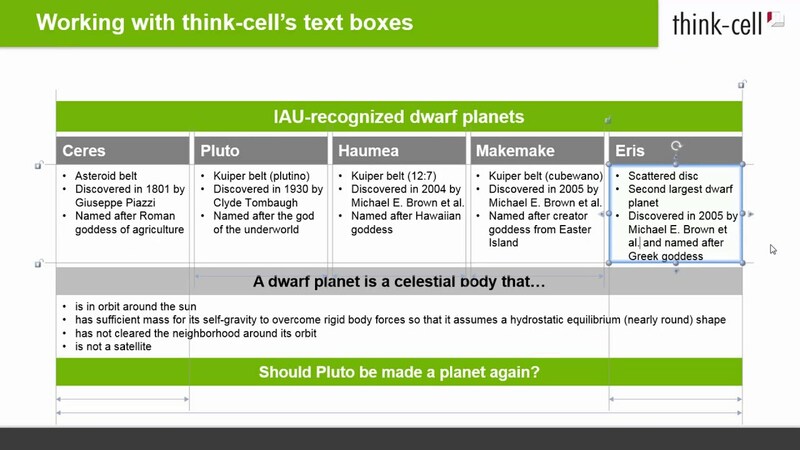 Build a web service that creates think-cell charts. Export your business intelligence reports as PowerPoint slides. The new "Flat" agenda style uses background fills instead of rectangles. Learn more. Tooltips now show labels and numeric values for individual datapoints. Chart types can now be switched between absolute and percentage, even when there's no axis. Learn more. The sort order of slices can now be easily changed for pie and doughnut charts. In waterfall charts, category sort options such as "Categories First Up, Then Down, Including Start" ensure that sum columns stay in their position. The baseline weight can now be changed. In previous versions you adjusted the column width by changing the gap width between columns. In think-cell 9, you instead adjust the column width directly by using the following handles: Learn more. Label rotation was changed by dragging a handle in previous version, while other properties like font size and number format were set using the floating toolbar. In think-cell 9, you also set label rotation in the floating toolbar. Learn more. In previous versions, milestones where shaped as a triangle or diamond and you switched between them with a button in the milestone's context menu. In think-cell 9, additional shapes were added. Therefore, you choose the milestone shape with a control in the floating toolbar, which shows a list of choices. Learn more. Quickly switch the decimal symbol (e.g., German to US format) for labels on all or selected slides. Learn more. Remove animations from all or selected slides. Learn more. Quickly choose custom colors with the new eyedropper tool. Learn more. Multi-select labels with Ctrl+Alt+Shift+← → ↑ ↓. Duplicate elements, e.g., in tables and process flows, with Ctrl+Alt+← → ↑ ↓. Control agenda placement through a custom layout that can also contain more shapes for agenda slides. Learn more. Define theme color shades as a base color plus brightness. Learn more. Specify checkboxes with more options: non-square images, e.g., traffic lights, and all Unicode characters. Learn more. For a color scheme, specify that it is not remembered as the default for subsequent charts. Learn more. think-cell fully supports the new user interface for conflict resolution in PowerPoint 2016 that is based on whole slides. Concurrent editing in SharePoint/PowerPoint 2013 is also improved. think-cell 10 is available to all existing customers without additional costs. Of course, it is also available as a full-featured free trial. We would like to take the opportunity to say Thank you to all our users for their support and continued trust in our software. We hope that you will enjoy think-cell 10!